The Anchorage sport fish management area includes all lakes and all streams flowing into Knik and Turnagain arms between the Eklutna River and Ingram Creek. Anchorage, Eagle River, Chugiak, Birchwood, Peters Creek, Eklutna, Indian, Bird, Girdwood, and Portage; and two military bases, Elmendorf Air Force Base, and Fort Richardson Army Post are all located in this management area. 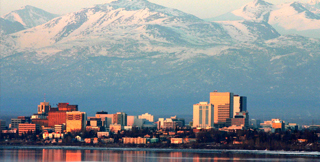 Over 700,000 people reside in Alaska (2013 U.S. Census), and over 40% reside in the Anchorage area. Access to area sport fisheries is primarily by road. Anchorage area land managers include private individuals, the Municipality of Anchorage (MOA), the Alaska Railroad (ARRC), the State of Alaska Department of Natural Resources (DNR), the U.S. Forest Service (USFS), the U.S. Bureau of Land Management (BLM), the U.S. military and Native organizations. Angler effort in the Anchorage area is estimated on average at around 97,000 angler days, or about 4% of the total statewide sport fishing effort and 6% of the total Southcentral Alaska effort. The Anchorage area offers unique and diverse recreational fishing opportunities in an urban environment. Most of the major area sport fisheries occur in fresh waters and target three species of salmon: Chinook (or king), coho (or silver), and pink (or humpy). Anglers also fish for rainbow trout, landlocked Chinook salmon, and Dolly Varden. Turnagain Arm supports a popular "personal use" eulachon (hooligan or smelt) fishery. Wild stock salmon sport fisheries occur in several Turnagain Arm streams, including Bird Creek (pink salmon) and the Twentymile River (coho salmon). The Ship Creek salmon sport fishery is the most popular and successful area stream fishery, with anglers targeting stocked Chinook and coho salmon. Other popular stocked coho salmon fisheries have been established in Campbell and Bird creeks. The Anchorage area stocked lake program includes over 27 lakes and streams stocked with rainbow trout, and some of these lakes are also stocked with landlocked salmon, Arctic char, and/or Arctic grayling. The Anchorage stocked lakes program offers a range of diversity from urban settings to hike-in backcountry experiences.